TBILISI, DFWatch–Georgia will supply Saudi Arabia with about 100 armored medical evacuation vehicles. Tuesday, the company Delta announced that it had won a tender announced by the Defense Ministry of Saudi Arabia, and the total value of the vehicles to be exported is about 100 million laris. The Didgori is an armored medical evacuation vehicle primary role is to ensure transportation of wounded soldiers and provide first aid during transportation, according to the Delta website. It is produced by Delta and based on the Ford F-550 Super Duty truck, fitted with armored plates which provide protection from 7,62 caliber armor-piercing bullets from close range and artillery shell fragments, according to the producer. The Didgori, which was first unveiled in 2011, was sent to participate in the tender in August, 2014, and went through tests in the field, including speed test, engine test and driving in mountainous and desert terrain. The Didgori faced six other vehicles. In the final stage of the tender, Delta competed against the American Company LENCO. In the beginning of 2015, the company received an order for a vehicle with specific technical abilities. In March, an official delegation from Saudi Arabia arrived to evaluate the vehicle and that it is produced in accordance with the order. Delta signed an agreement with Saudi Arabia in December, agreeing to provide about 100 of the vehicles. The first 12 vehicles will be shipped to Saudi Arabia on January 30. According to a spokesperson for Delta, Georgia has never had a contract of this scale for military production before. Delta is a company producing mostly military machinery and is subordinate to the Georgian government. 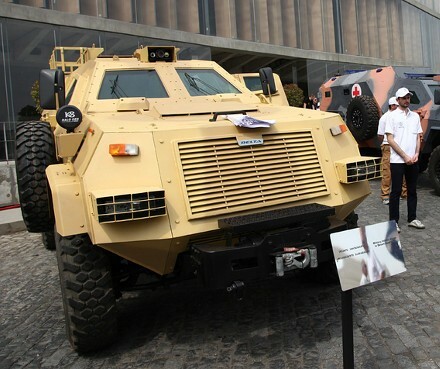 The company was established in 2010, and in 2011 began production of the armored vehicle Didgori. Giga Inashvili, a spokesperson for Delta, told DFWatch that this is the first case of another country buying Georgian military machinery. He continued saying that Saudi Arabia in total requires 6,000 vehicles and that the kingdom may purchase 500-600 more vehicles this year. Inashvili said Delta has sold light armor abroad before, including means of individual protection, to Azerbaijan and the Middle East.